Fonda, Henry; As Told to Howard Teichman. New York: New American Library, 1981. 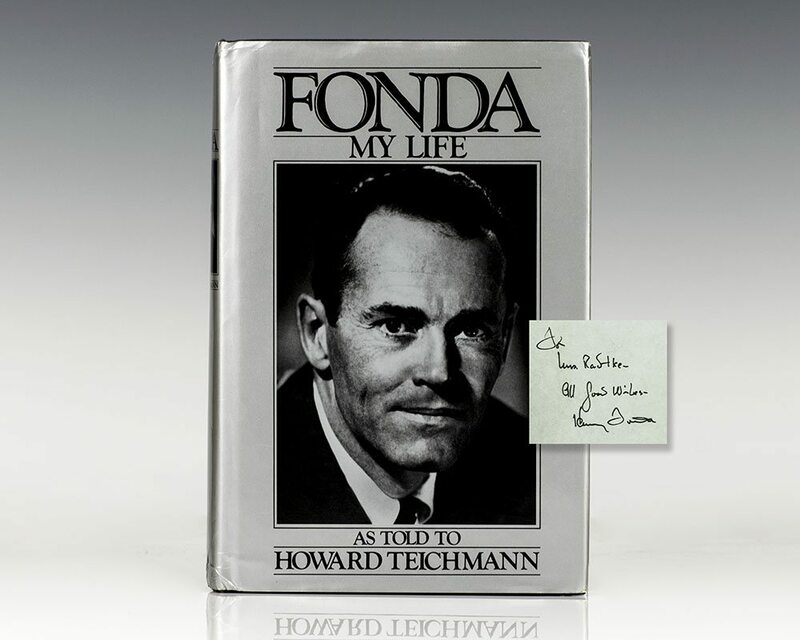 First edition of Henry Fonda’s autobiography. Octavo, original cloth. Boldly inscribed by Henry Fonda on the front free endpaper. Near fine in a near fine dust jacket with light wear. Jacket design by Richard Rossiter. Uncommon signed and inscribed, as Fonda passed away in 1982. Henry Fonda was an actor whose career spanned five decades. Fonda made his mark early as a Broadway actor. He also appeared in 1938 in plays performed in White Plains, New York, with Joan Tompkins. He made his Hollywood debut in 1935, and his career gained momentum after his Academy Award-nominated performance as Tom Joad in The Grapes of Wrath, a 1940 adaptation of John Steinbeck's novel about an Oklahoma family who moved west during the Dust Bowl. Throughout five decades in Hollywood, Fonda cultivated a strong, appealing screen image in such classics as The Ox-Bow Incident, Mister Roberts, and 12 Angry Men. Later, Fonda moved both toward darker epics such as Sergio Leone's Once Upon a Time in the West and lighter roles in family comedies such as Yours, Mine and Ours with Lucille Ball, winning the Academy Award for Best Actor at the 54th Academy Awards for the movie On Golden Pond, his final film role.